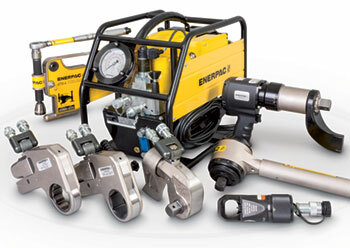 Aligning a pipeline with one simple and efficient alignment tool, tensioning the pipelines’ studs, bolting the bolts with high precision together, and controlling the levelling and positioning of a complete offshore platform; Enerpac has developed a range of high-pressure hydraulic tools and solutions, which are applied in many large scale projects within the oil and gas industry. Safety, productivity and environment-friendliness are core Enerpac values and are the central focus in the design and deployment of its tools and solutions. Safety is paramount. Workers’ safety must be guaranteed during execution and the solutions provided must contribute to safety. High safety standards have been integrated in the Enerpac processes and designs to ensure public and worker safety. Enerpac’s strong, robust high pressure hydraulic tools and equipment deliver an outstanding safe and efficient performance, even in harsh and extreme industrial conditions and environments. The company’s experience and expertise is second to none; Enerpac’s breadth and depth of products and solutions is unrivalled; and the commitment to HSSEQ ensures continuous improvement. The increasing global demand in the oil and gas industry calls for an innovative drive, which needs to grow along with the global market developments. Enerpac has increasingly become involved in providing high-pressure hydraulic tools and solutions for relatively simple as well as complex projects to ensure controlled movement and positioning of structures. Participating in innovative projects worldwide, Enerpac sets market-leading standards and creates the perfect combination using standard tools, complete solutions and developing tailor-made solutions. The professional Enerpac Bolting Tools product range is a comprehensive assortment of professional tools for bolted joints, and is especially suitable for the oil and gas industry. The assortment includes multipliers, torque wrenches, tensioning tools, nut splitters, pumps and pipe and flange alignment and maintenance tools, all specially designed to enable safe and efficient use and higher productivity. They will stand out perfectly within the demanding oil and gas industry.